Customize the text display of your widget in the "Call Later" section. 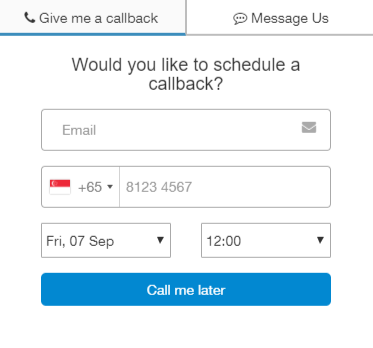 If your visitors visits your website after-hours, or if they choose to click on the "Call Me Later", the Scheduled Call Page will be shown. You'll be able to customize the Text Display. The default will be "Would you like to schedule a callback?" For scheduled calls, it's recommended that you add email as a required field, so that we can send email notifications to the scheduled caller.